For this exciting mid-week blog post, I would like to introduce our lovely WWOOF volunteer, Julie! She has generously written a guest post for Nidulari, to share with you her first experiences here on our homestead! I’d also like to remind all of my St Croix followers that this Saturday is a bake day, with orders accepted until noon on Friday. 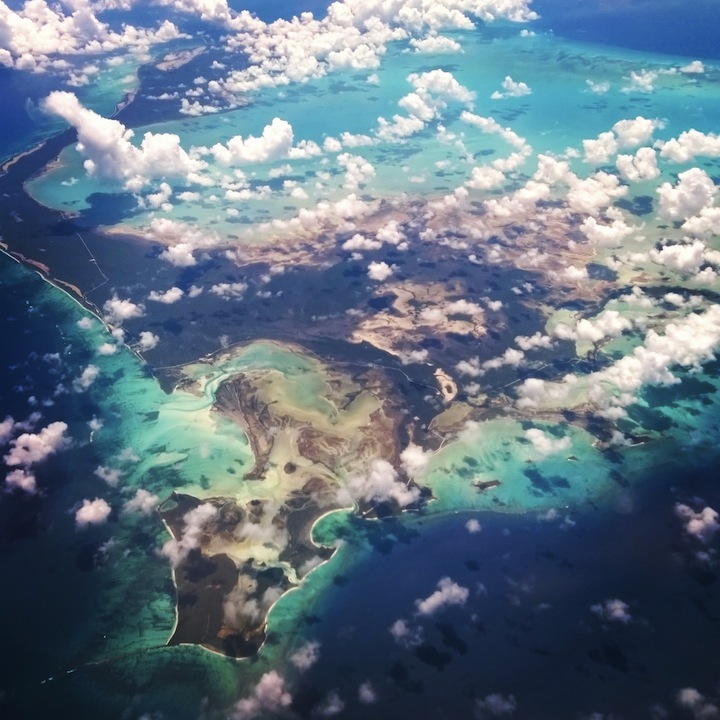 My view of the Bahamas out the airplane window on my voyage to St. Croix! 6:00 in the morning, my alarm goes off. In my past life, this very same alarm signified the beginning of another mundane day full of stale, inconsequential routine. Coming from an admittedly high maintenance, fast-paced lifestyle in the restaurant industry, I would typically be crawling into bed only a few hours before this time. These days, however, I find myself waking up even before my alarm sounds, eager to commence a workday full of outdoor learning, labor, and my new-found love for St. Croix! The avocado tree in front of the main house was quick to become my favorite. 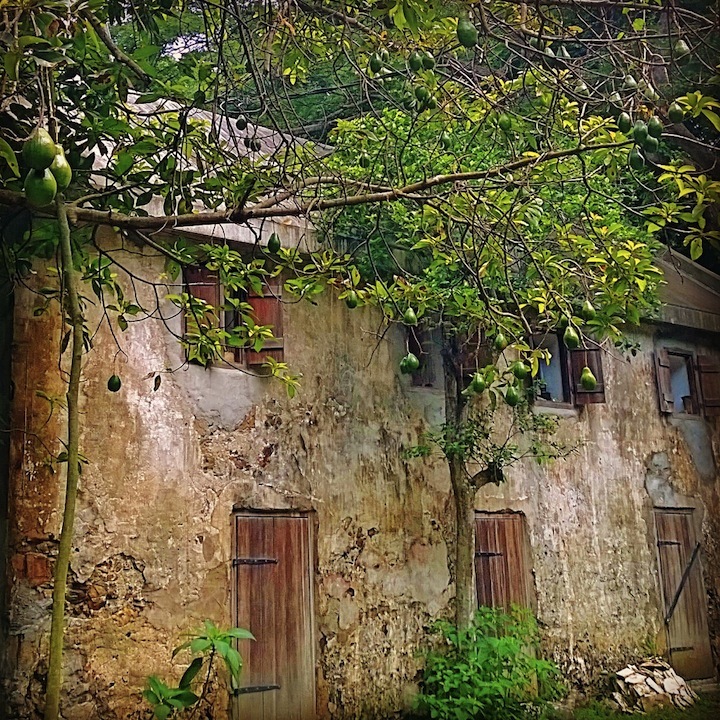 Rain or shine, the lush green canopy of coconut, avocado, and papaya leaves prolifically scattered around Little LaGrange Village greets me every morning on my way to the main house for coffee with Merryn. Heavy with fruit and competing for sunlight, the trees bend over my path and make me feel as though I’m being embraced by the very nature I’ve sought so long to become closer to–and boy, am I getting exactly that in this WWOOFing experience! Having already become well acquainted with the congeniality of Caribbean culture, imagine my surprise to discover that the animals of LLGV rival the sociability of the STX natives! 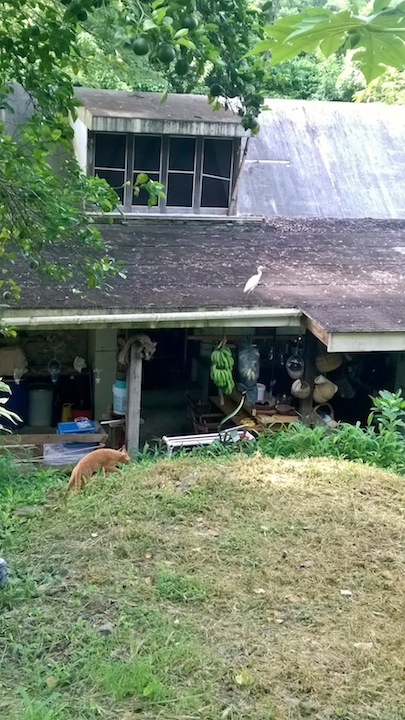 Chinah, the friendly orange cat, I’ve dubbed “The Mighty Huntress”, for her weekly offerings of slain rats and mongoose, which we like to interpret as her way of protecting our new batch of chicks. ZoZo is the sweetest dog you’ll every meet, and always amicably agrees to go on overly ambitious three mile walks with me to explore the magical rainforest surrounding LLGV…despite wearing a full fur coat. Then there’s Oonagh, the “Guardian of the Cottage”, who watches over our showers and dutifully keeps bed intruders of the cockroach variety at bay. 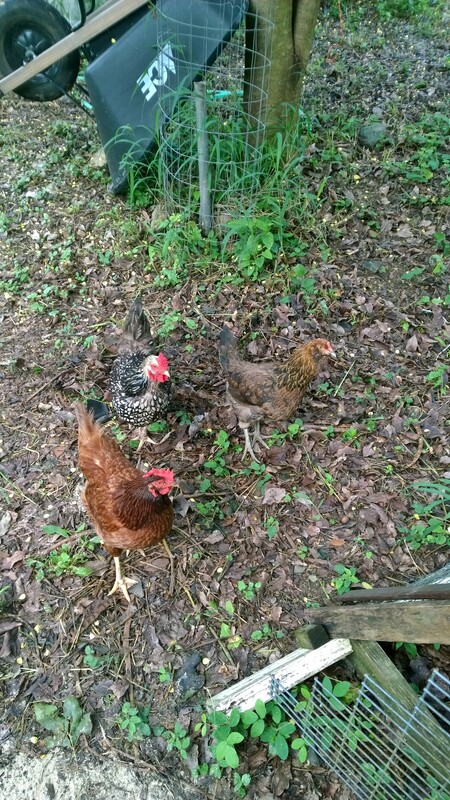 And although these are technically the only “domesticated” animals on the property, one may beg to differ upon meeting Merryn’s three adventurous hens (“The Golden Girls”) who are always en masse roaming the land, inspecting progress on the Nid and in the garden. Beyond them, you have Henry–the friendliest of egrets–overseeing my wood gathering, an assemblage of red-footed tortoises who are slowly building their version of the Taj Mahal atop some old Danish ruins, and of course a plethora of wildly fascinating and active lizards and geckos who hunt the mosquitoes and quite literally “hang out” with us at any given point in the day! 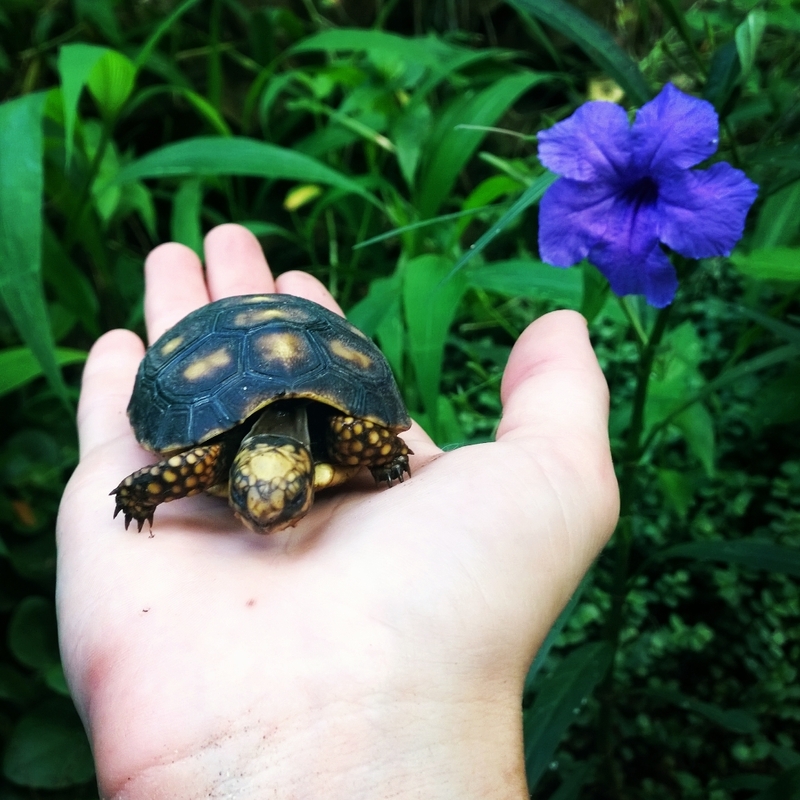 Ever-adventurous baby tortoise Bertha comes out to play on a rainy day. “The Golden Girls” are always trying to be incognito, but are never far behind us! Chinah stalking Henry the egret- to no avail. Being 2,500 miles away from my home, I feel I’ve made a wonderful new family at LLGV among these comforting creatures, most notably Merryn, Mandy, and Jan who have so graciously let me into their beautiful, pastoral house, and have shown me great kindness and patience while I acclimate to this new way of life and learn the many, many different names of plants and animals of the land. Their common day-to-day practices are steadily becoming less and less foreign to me….why, within the first few days of being here, I tried fifteen types of new and magnificent fruit, snorkeled with squid and barracudas, and learned how to properly mix, tint, and apply plaster to the walls of the Nid! The latter, not very well–I might add–but Merryn’s eternal optimism is leading me to believe that I’ll perfect the method soon! Still…not bad for a foreigner! 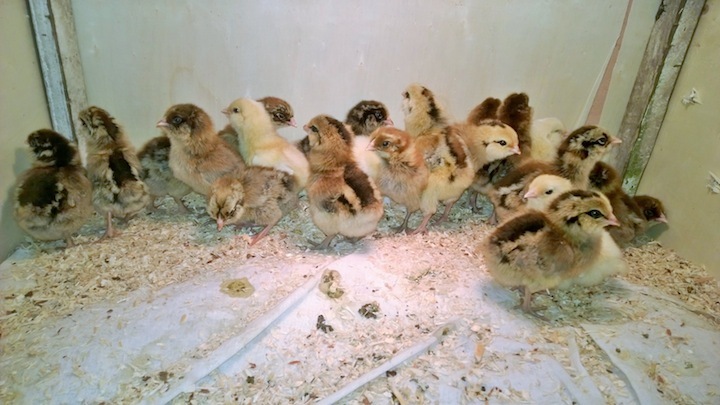 Our batch of chicks which seem to be growing at an alarming rate before our eyes! Being exposed to such a variety of tasks at LLGV has truly been life changing. This WWOOfing experience is allowing me to slowly relinquish my old and rather unsustainable lifeways and to adopt new habits which allow me to better harmonize with the delicate ecosystem we live in. While my pace of life has slowed, my work ethic has strengthened, and every day I spend working and living at LLGV imparts new knowledge, understanding, and appreciation for this beautiful world we are so very lucky to be a part of :) I’m so grateful to be here! Nice to hear from you, Carly! I couldn’t ask for better help on all my projects! Well, where do I begin, Jules you are a wonderful writer. Earlier this evening I was thinking about you and your adventure. I was wondering if you were truly feeling at one with your decision to travel to St Croix and your new odyssey, Well, you have calmed my fears and let me know that you are exactly where you wanted to be, away from the hustle and bustle and to be one with the earth. I love you Julie and hope you feel this same way every day and learn how to unclutter the mind and let new thoughts and ideas abound up there. Sleep well cutie and know that I am behind you 100 percent. Nighty night. Good post. Seems Julie is fed up with the urban rat race also. You will eventualy have a host of followers, convertees, disciples, acolytes, devotees, soulmates or whatever.